The Purgatory Control is part of Specialized’s All Mountain range and can be used on front or rear, but is more commonly used for the front. It’s 2.3″ wide and in the 26″ version weighs 685g. The bead is foldable and is tubeless compatible as well. It’s a chunky tyre, but the tread is well spaced out for mud shedding and huge side lugs for cornering grip. Those side lugs are made from softer 50a compound, compared to the harder 60a for the centre lugs; enabling a good balance between rolling and grip. I managed to get some varied conditions to test the tyre, from reasonably dry to plenty of puddles and surface mud. My old Weirwolf really needed a little bit of give in the trail to grip – it didn’t suit dry, so I was really pleased to immediately notice an improvement with the Purgatory. Although those side lugs are large, they really gripped even on the hard packed surfaces, giving me more grip and confidence leaning into corners. A bit too much confidence as it turned out as I banked too hard in a tight chicane and clipped a tree! I can’t blame the tyre for that though! There is a nice rock garden on Croft Trail, and it is somewhere I had struggled for grip previously, with my elderly tyres going as much sideways as forwards. The Purgatory kept its line perfectly though, at the same time as the old rear continued to skid out, which was very impressive. Even on another day when both tyre and rocks were wet, it still held its line. In fact, on the wetter day I didn’t notice any change in grip at all – I got the same predictable cornering performance. The grip of the tyre is very impressive, as is its predictability in different conditions. Although it is a little heavy, it’s not too bad and certainly sturdy. The price is excellent, even before the amnesty, making its current discount a bargain. 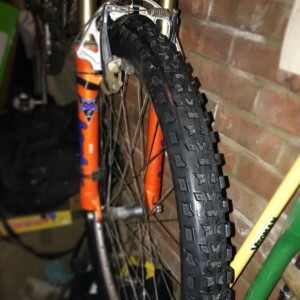 The Specialized Tyre Amnesty is on till 30th April, so if you’re after a new trail tyre for the front, I would definitely recommend checking out the Purgatory Control. (Next Post) What has happen to Standover Heights?